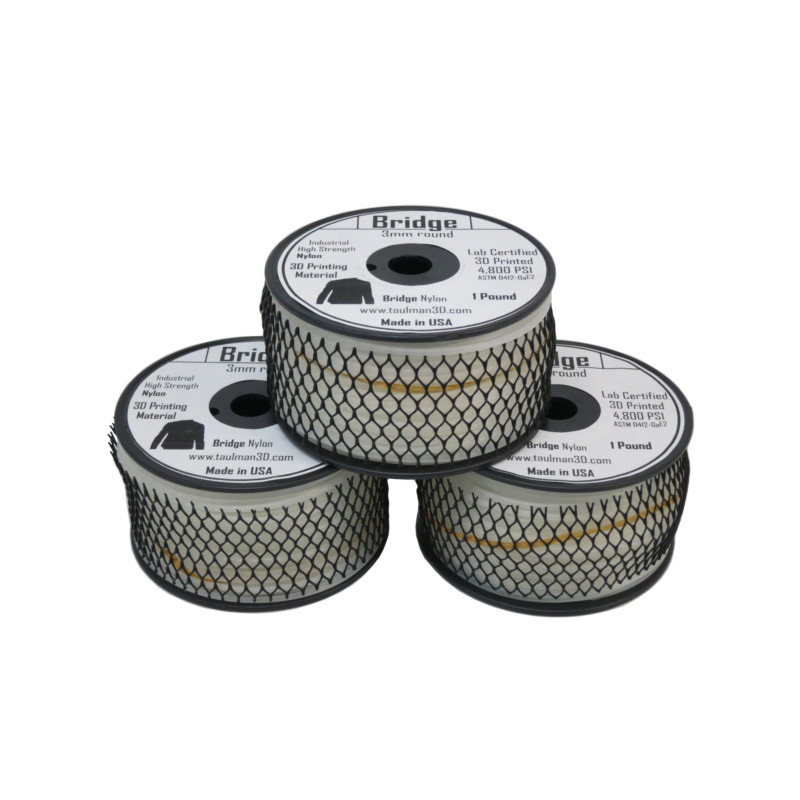 Save $12 on three (3) 1lb spools of Taulman Bridge filament for 3D Printing. This filament is called "Bridge" because it combines the strength of Nylon 645 with the price and ease of printing of ABS and PLA. This formulation has been specifically created and tested for use in 3D printing. Lab certified measure of tensile strength. The great thing about Taulman Bridge filament is that it maintains the superb strength of Nylon while having less warping, better adhesion to the bed, and just being easier to print. 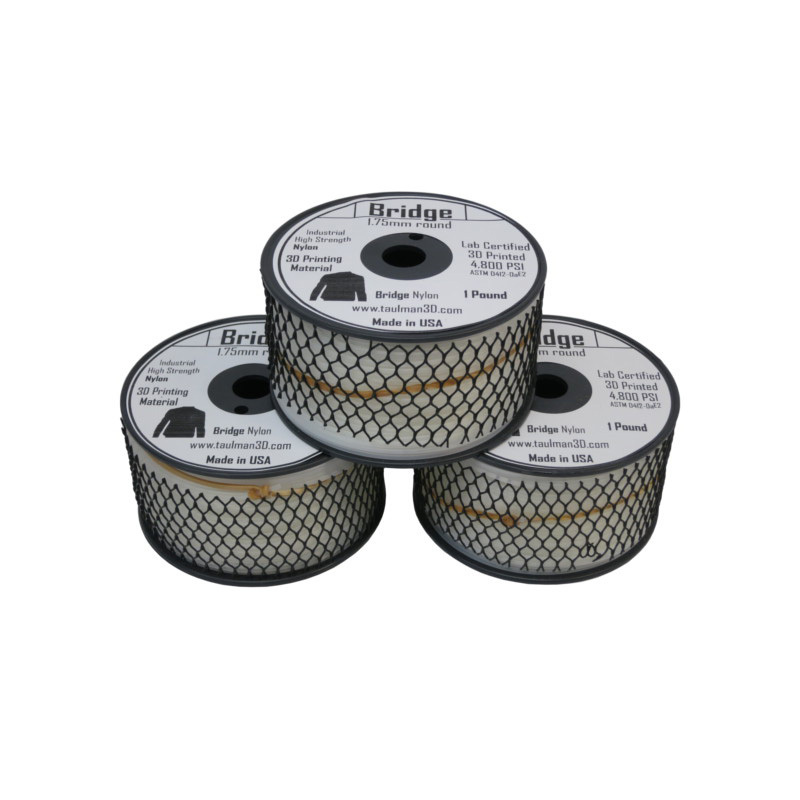 This material is ideal for printing industrial and household goods such as gears, machine parts, or even 3D printer replacement parts. We recommend starting off with Bridge filament before moving on to other Nylons since it's easier for beginners to work with. Additionally, Bridge is significantly stronger and more durable than both PLA and ABS. Taulman has done a great job creating this material. If you have printed with Taulman 618 and 645 you will know that there are challenges to printing those Nylons (which can be overcome). This material has been extensively used to print prosthetic parts such as fingers and hands. You can print this material straight onto glass and use some PVA glue or Elmers glue to get it to stick properly to the bed. Bridge has much stronger adhesion to the bed and the edges of the filament don't curl upward as easily. When printing support materials you can easily remove the bridge support material (which is a major improvement from past Nylon variations). Basically you can print this material and easily break off the support and then you are good to go - no sanding or polishing is necessary. Even a Bridge part printed with very low infill will maintain strength and durability.